kc bob: Who owns Congress? 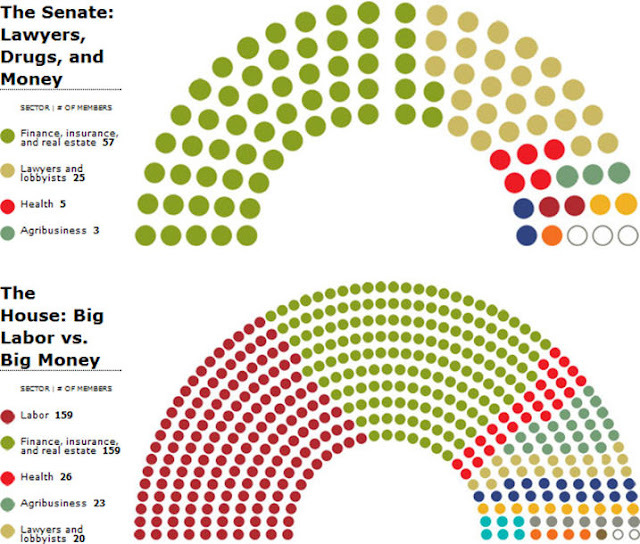 This interesting chart from a 2010 Mother Jones article presents an interesting image of congressional donors. They purport that to the dots on the chart represents the industries which gave them the most money over their entire careers. So interesting to note the different patterns between the two congressional houses. Seems like Finance, Insurance and Real Estate are the power players. You can get the full story and dotted details here. Yes, John Stewart! We Built It! Is Tolerance an Aspect of Love? Do Missourians already have a Right to Pray?